America in the Spring of 1883. Carver beat Bogardus 100-97 in their 9th match. The date was February 21, 1883. Finally, the two greatest shots in the world were going to meet head to head in the "Shooting Championship." of the world. They both arrived in Louisville, Kentucky to settle this long standing feud. He was 6' 4" and weighed 265 pounds. A huge man by the standards of the day. This was Doc Carver, the "Spirit Gun of the West." He was born in the little town of Winslow, Illinois in 1840. He was neither a doctor nor a dentist. As he had always maintained that Doc was his given Christian name. His direct descendants stepped off the Mayflower at Plymouth Rock. 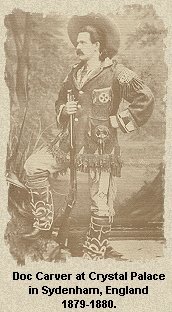 He became a matchless buffalo hunter and marksman. His own estimate of killing over 30,000 buffalo during his hunting days is staggering. At the age of 36 in 1876 he found himself in California and reading the early sporting magazines of the men that were making fortunes by shooting. Carver was a modest man. He never boasted and was a real sportsman. He was thoroughly honest and could not understand how people could be dishonest. Many times early in his shooting career matches were rigged against him with little chance of winning. He always won anyway. Finally on February 21, 1883, 6 years after his challenge to Bogardus, the two would finally meet. History was in the air. 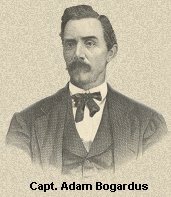 The great Captain Adam Bogardus was born in 1833 in Albany County, NY. He is undoubtedly one of the best pigeon, glass ball and clay target shooters of all time. He was 50 years old when he met Doc Carver in their 25 match tournament for George Ligowsky, the inventor of the clay target. His family moved to Illinois when he was a young boy and later to Indiana. He took up pigeon shooting in 1868 and became the greatest pigeon shooter in the world. He was a man of many talents. He developed a glass target ball and a glass ball trap. He also wrote several books, one on his shooting accomplishments titled Field Cover and Trap Shooting. Bogardus was a very boastful man, a man with a huge ego, always promoting himself as the champion of the world. He was not a military captain. He just assumed that name sometime during his long and successful shooting career. However, on this cold February week in Louisville in 1883 he would meet his match in Doc Carver. Captain A. H. Bogardus, the champion shot, arrived in the city yesterday morning, and immediately repaired to the Louisville Hotel, where his rival, Dr. Carver, is stopping. Neither of them "recognized" the other, although they met several times during the morning and dined at adjoining tables. Captain Bogardus remarked to a friend in a fatherly way that the "young 'un seemed to be in fine form, and Dr. Carver was overheard saying as he blushed before a plate of potato salad, that "the old man was looking pretty well himself." Once or twice they glared politely at each other, and the scene was rather amusing. Captain Bogardus would transfix a baked apple with his fork, and then cast a quick glance at Carver, who at that moment was sipping his ox-tail soup, timidly eyeing the Captain over the rim of the bowl. Thus did the champions dine. Later on they happened to come together at Griffith & Sons establishment (a sporting goods store) and Colonel Joe Griffith stepped forward and introduced them. The Doctor bowed low and acknowledged the presentation, and Bogardus returned the compliment, and for the first time in four years the champions spoke to each other. The next day, February 22, 1883, the match was held at the Jockey Club with the stakes at $500.00 each plus the gate money. One hundred live pigeons each, five ground traps and a 30 yard rise. Doc won the shoot 83-82, thus allowing Bogardus a chance to challenge for further matches, which he did. Doc accepted everything he proposed. They moved on to Chicago where they shot live birds again, Doc beating Bogardus for the second time in a row, 82-79. While in Chicago they also shot a match of 100 Ligowsky clay targets with Doc winning that also, 72-63. This innocent side match would have lasting ramifications on the shooting world. Back in Cincinnati, news of the results of the clay target shoot in Chicago placed a seed in George Ligowsky's2 fertile brain. Perhaps he could get these two great shooters to tour the country shooting his new clay targets as they did in Chicago. What better way to introduce his new invention to America and the world. He had better hurry because unknown to him over in Peoria, Fred Kimble and Charlie Stock were very busy developing a better target. This one was going to be called the Peoria Black Bird, the first composition target, much like the composition targets used today. This target and the others that followed shortly were to render his 100% clay target obsolete. So now the two famous shooting pugilists moved on to St. Louis on the same train to meet once again. Bogardus, still without victory needed a win in the worst way. He was being beaten by a younger and less experienced man twice at pigeon and once at clay targets. In his mind, a shooter inferior to his great talents. He was beaten by Carver in Louisville at live pigeons and in Chicago at pigeons AND Ligowsky clay targets. Bogardus continued to challenge, this time in St. Louis. These matches were major sporting events and attended by thousands. However, when they arrived in St. Louis each gunner received identical telegrams from the George Ligowsky Clay Target Company of Cincinnati, Ohio. This telegram would change trapshooting forever. We herewith make to you (Carver) and Captain Bogardus the following proposition: You and the Captain to shoot 25 matches at the Ligowsky clay pigeons, 100 clay pigeons each, five traps, 18 yards rise, use of both barrels, English rules, same conditions as the recent match in Chicago. Should you or Captain Bogardus, on any occasion, break 82 or more birds the winner, or if both should accomplish the feat, to receive $100 extra, and the winner of the match to receive $300 for each match. The first match to be shot at St. Louis during the present week; the second at Cincinnati March 10; and the balance to be shot in the principal cities in the United States before the 1st of May. They moved to Cincinnati, home of the Ligowsky Clay Target Company, by train for the next match, in a heavy snow storm. Carver took a 3-0 lead in the series with an 89-74 win. Next, by train to Kansas City where Doc again beat the Captain for the fourth straight time. This one was 91-69. "He has beat me," admitted Bogardus to reporters "but I attribute my bad shooting (and it has been bad to date) to a sore face and a light gun (7 pounds, 6 ounces)....I am accustomed to using a gun weighing ten pounds." The great Bogardus was a one eyed shooter. Doc told the Captain that he should stop closing one eye and there would be no more soreness of the cheek. "Than you shoot with two eyes open, Doctor?" said the old fox, who knew very well that Carver was a two eyed gunner. The big show next moved to St. Joseph, Missouri. Carver won his 5th straight match, this one by 92-63. Bogardus was proving to be no competition for Doc Carver. On March 17th they arrived in Omaha to find the city beside itself. Bogardus finally got his act together by breaking 90 targets but Doc smoked 94 to win his 6th straight match. It was also announced on that date the newly formed "Wild West Show" featuring Buffalo Bill and Doc Carver would be coming to Omaha. In the first 6 matches, Doc won them all, outscoring Bogardus by over 100 targets, 525 to 423. Captain Bogardus was humiliated. He could not seem to come up to his well established high standards of marksmanship. He was awful. He would win only three times, in Columbus, OH, Pittsburgh, PA and Providence, RI. There were three ties along the way. The matches were completed by the middle of April with Doc winning 19 times, losing three times and there were three ties. Doc averaged a .9308 average on the 2500 targets while Bogardus had an .8692 average. Complete list of all matches Finances of the tournament. 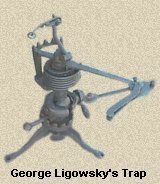 2 George Ligowsky invented the first clay target in 1882 in Cincinnati, Ohio. Popular at first, they were very hard to break and "rung like a bell" when hit. 3 Shooters of today might be interested in knowing what guns were used in this famous touring contest; it was the most famous in the history of shooting in America. Both were English shotguns and certainly were the state of the art guns during the period. There were non better in the world. Compare to today's Perazzi, Seitz or Kolar. Doc Carver used a W. W. Greener hammerless gun, 12 bore, weighing 7 pounds and 13 ounces. The shells were loaded by himself and were a mixed lot of Eley's green and U.M.C hulls. They held 4 drams of Curtis and Harvey powder No. 4 and 1� number 6 shot made in Chicago. Bogardus shot a W. C. Scott and Son's hammerless gun, 12 bore weighing 7 pounds and 6 ounces. He used Von Lengerke's Swell and Waterproof hulls loaded by himself with 4 drams of Orange Lightning powder, No.5, and an 1� of Chicago chilled shot No. 8 in the first barrel and No. 7 shot in the second barrel.